onsen soaker: Kannawa Onsen, Oita Pref. Fire!?!? No. They are so-called Yukemuri, steams rising from hot springs' fountainheads. 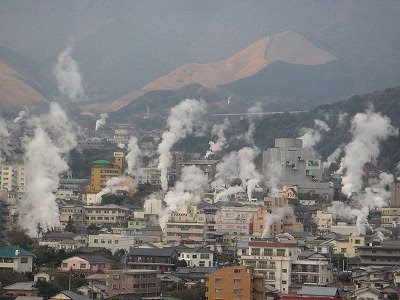 You might have seen pictures of such hot spring steams in wild fields, but these steams are part of daily life in Kannawa (pronounce as kan-nawa) , a tourism and residential area of Beppu City, Oita Pref, Kyusyu Region. Isn't it amazing? At some budget inns, they provide cooking facilities, you can cook sea foods, vegetables and other foods by onsen steam for yourself. Of course there are so many places for soaking. Kannawa Onsen is one of the Beppu Hatto (Beppu Eight Hot Springs). Beppu City is famous for hot springs, there are 2843 fountainheads in the city, no other cities in Japan have so many fountainheads (See statistics in English). You can go Kannawa(鉄輪) by bus from the Beppu(別府) Railway Station, taking 20 to 30 minutes depending which bus you take (There are various bus routes). Then you need to walk 15 minutes to reach the Yukemuri View Point（湯けむり展望台）, where I took the picture above. Or take a taxi from Kannawa bus center. Winter is the best season to see Yukemuri. have you visited the san benon hot springs in irosin, sorsogon, philippines? there is a volcano in that area which is the source of the wonderful hot spring there. Hi! thanks for your comment. I've visited Philippines three times, once for sightseeing , twice for scuba diving. I've never heard of the San Benon Hot Springs. When I visit Philippines next time, I will plan to visit there. Thanks again for the information. Looks and sounds incredible! Thanks for all of the great posts. So glad you left a comment here. I am an enthusiastic fan of your blog. Onsen of Phantom is coming up next week!